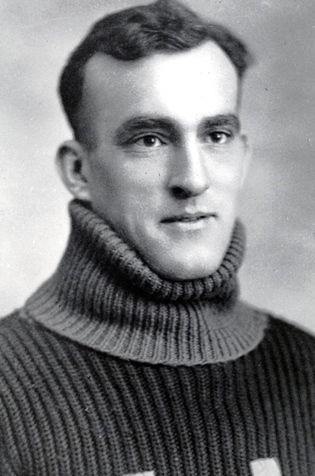 Ernest Cox was rated as one of the greatest snapbacks, or centres, of all time. Under coach Mike Rodden, Cox introduced the cross-field direct snap to the halfback. This play directly led to touchdowns in two Grey Cup games. Cox was also known for his defensive abilities and was a perennial all-star. In 1928 he became the first recipient of the Jeff Russel Memorial Trophy, presented to the Eastern Player possessing the highest qualities of courage, fair play and sportsmanship. Throughout his football career, Ernie Cox worked for the Hamilton Fire Department and on the gridiron was affectionately called “The Iron Fireman”.